Thank God for Alana Bennett! 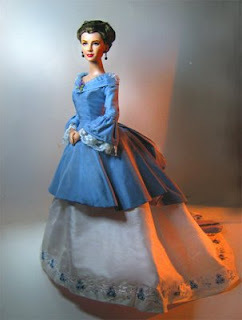 It was her who first gave me my Franklin Mint Scarlett dressed in the Barbeque dress. 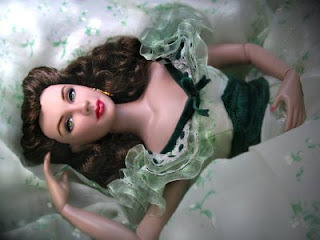 Immediately I was smitten by the doll and this paved the way for more Franklin Mint Scarlett purchases. It was Alana too who made it possible for me to have the white gown inspired by Bette Davis "Jezebel". Wasn't it a journey of back and forth deciding just how much tulle went into that gown. 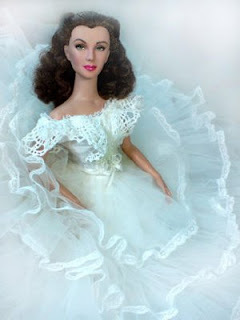 It was Alana too who created the Charleston Lace Ballgown inspired by the miniseries "Scarlett". She even gave me a beaded purse, gloves and completed it even more with pantalets, hooped skirt and lace shawl. And recently, Alana went more than just sewing and did embroidery work on a 2-piece bustle gown. For all these dreams that have come true, Alana, I thank you. It is hard being far away from the the source of all doll dreams for me. 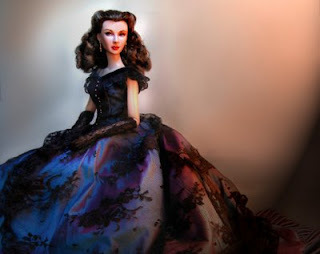 It is a struggle just yearning to touch the most expensive dolls and gowns in websites here and there. It can also cause you many a guilty-days just purchasing one and waiting 3 weeks for a doll and gown to arrive. But Alana Bennett surely made some of those dreams come true for me. Cheesy this may be, but it comes with the deepest and sincerest gratitude from the bottom of my and my Scarlett dolls' hearts.